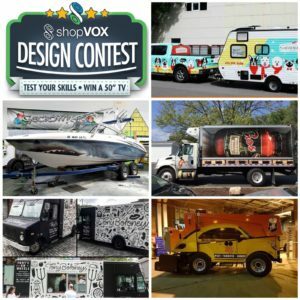 The Vehicle Graphic Design Finalists are Out! Vote for your Favorite! top five finalists from all of the submissions. But, we did and I think you are going to enjoy them – and even be a bit WOWed! The finalists include a boat wrap, trailer wraps, truck wrap, a food truck wrap, and even a Zamboni wrap. Visit our Facebook page and like your favorite one! Each finalist is a user of either signVOX or shopVOX business management software. Also share with your friends using #VOXcontest. Each vote that is cast, helps one custom shop closer to winning a 50 inch TV to use their #VOX software on. So make sure you check out the finalists and like the one with the best design. You can like or heart it. To learn more about our Design Contest, visit our #VOXcontest Page. Enjoy!